Abbot Melvin J. Valvano, was born in Linden, N.J. in November of 1938. He graduated from St. Benedict's Prep in 1956. He then went on to enter the novitiate for St. Mary's Abbey, Newark and made profession in the Abbey Church on September 12, 1959. 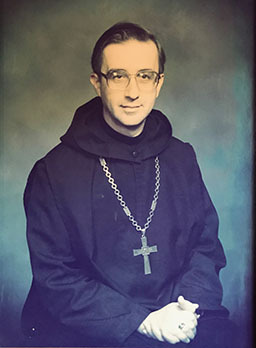 Following his monastic profession he went on to attend St. John's University in Collegeville, Minnesota where he received his BA in Philosophy. He was ordained a priest on May 29, 1965. He would go on to serve as prior of Newark Abbey beginning in January 1969 during this time he would pursue graduate studies, completing a Master of Arts in French and Education at Seton Hall University, and served as a chaplain at the V.A. Hospital in East Orange, N.J.
On September 8, 1973, he was elected the Second Abbot of Newark Abbey. At the time of his election as Abbot, Fr. Melvin Valvano was 35 years of age. The youngest Abbot in the history of the American - Cassinese Congregation of Benedictines. After 45 years of service as Abbot he is now the longest serving Abbot in the history of the Congregation. He has been re-elected continuously as the abbot since 1973. 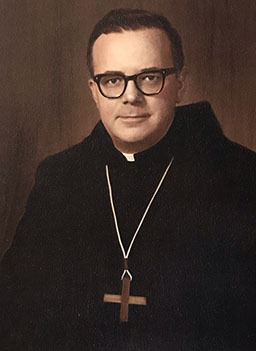 Abbot Melvin, also served as the Abbot President of the American Cassinese Congregation of Benedictine Abbeys from 1989 until 2001. Abbot Melvin continues to shepherd his flock and in the past few years has witnessed a remarkable increase in the arrival of new members to the community, a work he credits to the Holy Spirit and the prayers of the monks and many others. 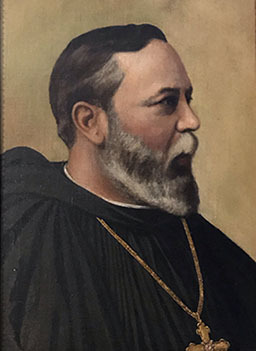 Abbot Ambrose J. Clark, O.S.B. , was elected as Abbot of Newark Abbey on December 14, 1968. He had previously served as the Headmaster of St. Benedict's Prep. Abbot Ambrose was elected during a tumultuous period in the history of the city of Newark and indeed in the life of the community. In July of 1973, having guided the newly independent monastic community through this period to the best of his ability and having suffered with the community through the stress and anxiety of the closing of St. Benedict's and then it's re-opening, as well as the renewal of the monks' commitment to the monastic life lived here in the city amongst the people of this time and this place, Abbot Ambrose tendered his resignation. 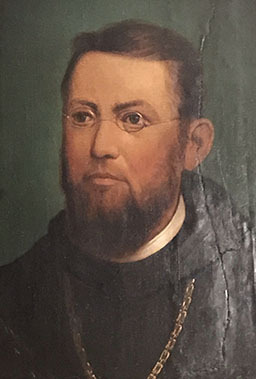 Abbot James Zilliox, a native son of Newark, born October 14, 1849, was baptized at Saint Mary's Church, attended Saint Mary's Grammar School, and had grown up in the shadow of Saint Mary's Priory (to become an Abbey in January 1885). He was installed as Abbot by Bishop Wigger on July 22, 1885. Due to the poor health and the stresses of the Abbatial office, Abbot James resigned November 2, 1886. Abbot Hilary Pfraengle was born in Butler, Pennsylvania on May 9, 1843. All of his early education was completed at Saint Vincent College in Latrobe, PA. He completed his novitiate and professed his first vows at Saint Vincent's on November 13, 1862. He was ordained in May of 1866. He would then go on to complete the Degree of Doctor of Divinity in Rome, after which he would return to Saint Vincent's where he held the chair of Dogmatic Theology and Sacred Scripture at the seminary. On December 17, 1886 Fr. Hilary was elected the Second Abbot of Saint Mary's Abbey. It was during Abbot Hilary's term as Abbot that the Abbey would become integrated, with its first African American monk. During the tenure of Abbot Hilary, standards at St. Benedict's Prep continued to rise, the priest- monks of Saint Mary's served in various parishes around the state of New Jersey, and Saint Raphael's Parish was established in Manchester, as was Saint Anselm's Abbey. Abbot Hilary died aged 66, on December 21, 1909. Upon his death the community had grown in many ways since his election twenty-three years prior. It staffed a college, two preparatory schools, and several parishes in New Jersey, Delaware, and New England. Fr. Ernest (Joseph) Helmstetter, was born on October 7, 1859 in the city of Newark. He attended St. Benedict’s in the “Down Neck” section of Newark for grammar school. He attended St. Benedict’s College and later St. Vincent’s College in Latrobe, PA where he entered the novitiate. He was ordained in June 1884. who had served the community in Newark as the prior and procurator was chosen two weeks after the death of Abbot Hilary and received the Abbatial blessing on April 5, 1910. During Abbot Ernest’s tenure, St. Benedict’s student body grew from less that two hundred students, to more that seven hundred. In 1917, St. Benedict’s College became St. Benedict’s Preparatory School, when it was decided to drop the college program, which by that time had become outmoded. During Abbot Ernest’s tenure the school would become an accredited member of the Middle States Education Association. In 1914, the abbey received petitions by local Catholics to build a parish in the neighboring town of Hilton (Maplewood). As a result of these petitions and the local bishop’s receptiveness to this pastoral need, St. Joseph’s Parish was founded on April 20, 1914 and staffed by the Monks of St. Mary’s.In 1914, Abbot Ernest was elected the Abbot President of the American-Cassinese Congregation. He served in this capacity for 18 years. In 1929 and 1930, two monks of St. Mary’s went overseas, when Abbot Ernest sent Fr. Damian Smith, and Fr. Gregory Schramm to help staff the faculty of the Catholic University in Peking, China. As St. Anselm in Manchester continued to grow, it became clear that it would soon become an independent monastery and so there would be a need for land in the country where a proper theologate could be established for the study of clerics, as a result the Delbarton property was purchased in Morristown under Abbot Ernest’s leadership. In his later days, failing eyesight, would cause Abbot Ernest to turn over the day-to-day administration to his Prior – Fr. 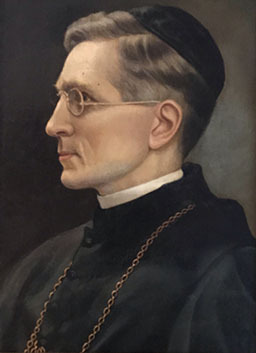 Anselm Kienle.Abbot Ernest died from a heart attack on July 6, 1937.The community flourished and grew during his Abbacy, and by the time of his death, The Ordo, showed a membership of 85 monks of St. Mary’s Abbey. Fr. Patrick Mary (Edwin Raphael) O’Brien, was born in Manchester, NH on October 29, 1885. 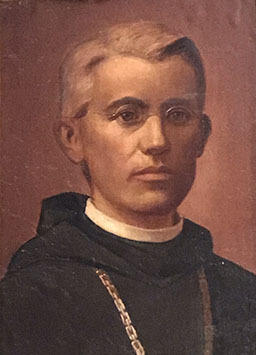 He attended Saint Anselm’s Prep and later Holy Cross College.His academic life was marked by poor health, a condition which would have an affect on his entire life. Having spent time teaching Latin and History at St. Joseph’s in Manchester, he later went on to enter the novitiate at St. Vincent’s in June 1914. In July 1915 he was professed as a monk of St. Mary’s and returned to St. Anselm’s to study Theology. He was ordained on May 29, 1920. He was appointed pastor of St. Joseph’s in Maplewood in 1933. In 1937, following the death of Abbot Ernest, Fr. Patrick Mary was elected Abbot.He promptly appointed Fr. Celestine Staab as the pastor of Saint Mary’s Church a position he would serve in faithfully until 1958. 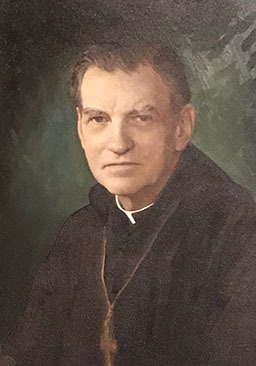 Abbot Patrick, would go on to further develop the Delbarton property at Morristown, which had been purchased by his predecessor.A new monastery (1938) and the Delbarton Prep school (1939) were built on the property. A major interest of the Abbot was the Sacred Liturgy, and he would serve as a proponent of the Benedictine Liturgical Conference in 1940, encouraging Fr. Benedict Bradley of St. Mary’s to publish what would become known as the Saint Mary’s Missal – which featured not only the text of Liturgy, but also brief histories of the Catholic Church in each of the States of the Union. With the Second World War, came a need for chaplains for the fighting men of the armed services. Abbot Patrick granted permission to Fathers George Sherry, Maurus Mc. Barron, Eugene Polhemus, Dunstan Smith, Martin Burne, and Philip Hoover to enter the military as Chaplains. Also, several foreign monks were granted permission to resided in Newark and Morristown during the war, when they were displaced. By the mid-1950’s the two communities at Newark and Morristown were undergoing tension as each grew and thrived, yet felt held-back by the other. In 1956 Abbot Patrick, presented a plan to transfer the title of Abbey from Newark to Morristown.Following the transfer, the Newark House would revert to the dependent title of St. Mary’s Priory, while the Morristown house would become St. Mary’s Abbey. During Abbot Patrick’s tenure - St. Benedict’s Prep continued to thrive and in 1958 the prep would see the addition of a new academic building.Culturally the monastery continued to expand as it set up a foundation in Brazil, following the requests of the wider Church. In 1966, the now 81-year-old Abbot Patrick, petitioned Rome for the help of a Coadjutor Abbot.Fr. Martin J. Burne, who had served as Prior in Newark was chosen for this role. On March 30, 1967, Abbot Patrick died, having served for 30 successful and prosperous years. Fr. Martin J. Burne, was born on December 18, 1914, in Irvington, New Jersey. He attended St. Benedict’s Prep and graduated in 1932. He made Monastic profession to St. Mary’s Abbey in 1935 and was ordained a priest in 1940.He would go on to serve as a U.S. Marine Corps Chaplain during the Second World War, and would then return to teach at St. Benedict’s following the war. He also served as pastor of Sacred Heart Parish in Elizabeth, NJ.Abbot Patrick later recalled him to Newark and then served as the Novice master at Delbarton. Having served as Coadjutor Abbot along side Abbot Patrick, he received the Abbatial Blessing in 1967 and became Abbot in his own right. With the Newark riots taking place in the summer of 1967, the “white flight” which followed, and the devastation of the city which would take decades to recover from, the Benedictines in Newark began to look deeply at their commitment to the city of Newark. In 1968 following years worth of discussions about separation between the Newark and Delbarton communities, the capitular monks, voted that the Newark house be given independent status. Following the independence Saint Mary’s Priory in Newark, on November 21, 1968, Abbot Martin returned to St. Mary’s in Morristown where he served as Abbot until 1971 when he resigned. Following the independence of the monastery in Newark it was again raised to the status of an Abbey – an event that was successful because of the support and care of Abbot Martin.The task of setting a date for the election of a new Abbot for the now independent “Newark Abbey” under the patronage of the Immaculate Conception would now be set at a meeting on Tuesday, December 3, 1968. Abbot Martin J. Burne died on July 25, 2003.